This month’s Malaysian Food Fest features the local cuisine from Negeri Sembilan, which is known for their liberal use of chili, especially bird’s eye chili aka chili padi by the locals. Like all the other MFFs of other states, I am keen on the look out for unique dishes which are representative of that region. Negeri Sembilan was no exception. Through Wendy, I came across daun puding, commonly grown for ornamental plant for their beautfiul shades which the foliage manifest in, from mauve to maroon. Spent the whole month looking for it in Singapore but to no avail. Apparently not that common in Singapore. And just as this month’s event reaches its closing, I finally found a small patch of it within walking distance from where I reside. But I was kind skeptical as plant I saw did look kinda different from the others over the internet. Not wanting to risk having sakit perut or worse, cirit-birit I abandoned the idea of cooking rendang out of it. 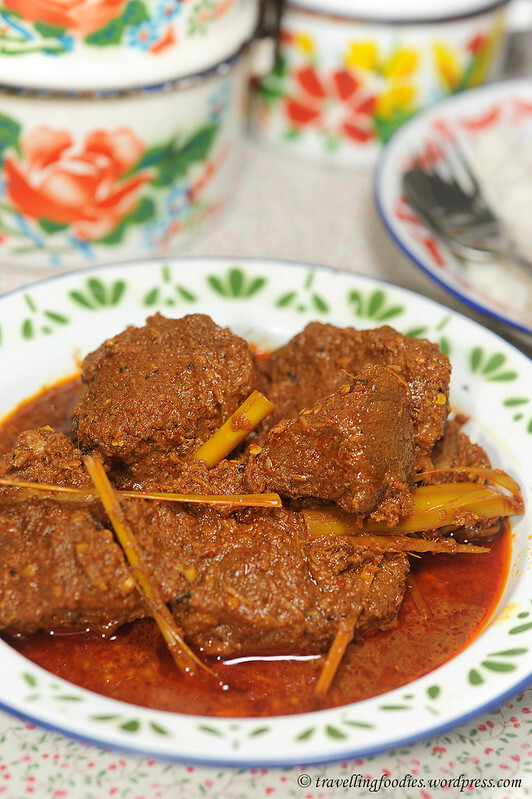 I settled for something less exotic, but no less delicious, Rendang Daging Rembau. 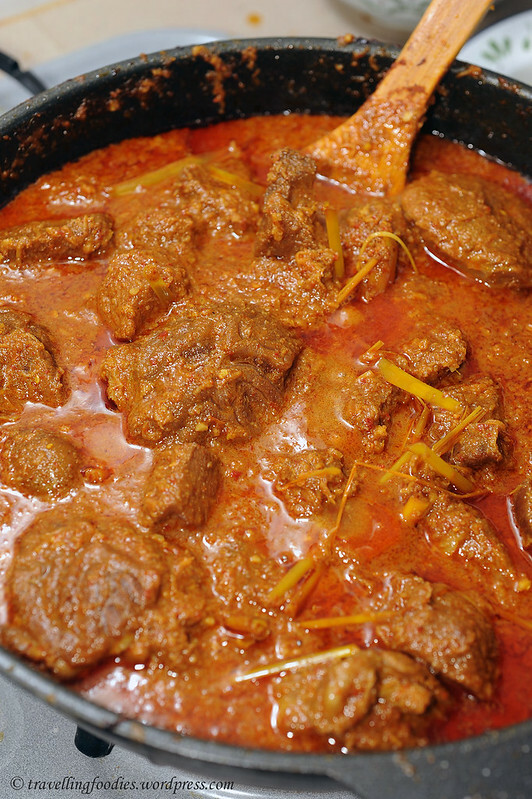 Rendang is a spicy beef stew, common to the Malay Archipelago. Using a hoard of condiments and spices as well as the rich flavours from thick coconut milk, beef is slowly cooked for at least an hour, and sometimes more depending on the cut used. The version I’d prepared comes from the region of Rembau, a small town in the state of Negeri Sembilan which currently has seven districts, down from the historial nine “sembilan” in which the name of the state derives from. 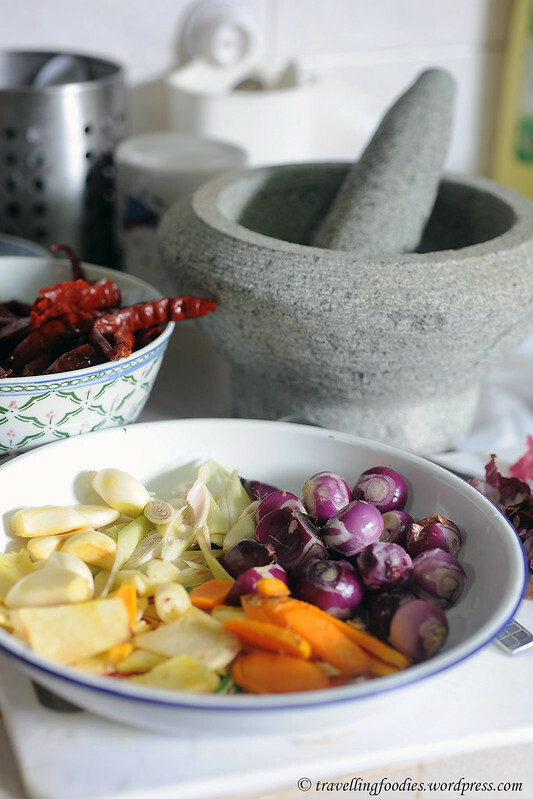 Typical to Minangkabau cuisine, which originated from Sumatra Indonesia, the food from Negeri Sembilan which is one of the largest strongholds of the Minangkabau community outside Sumatra, is well-known for being exceedingly spicy. 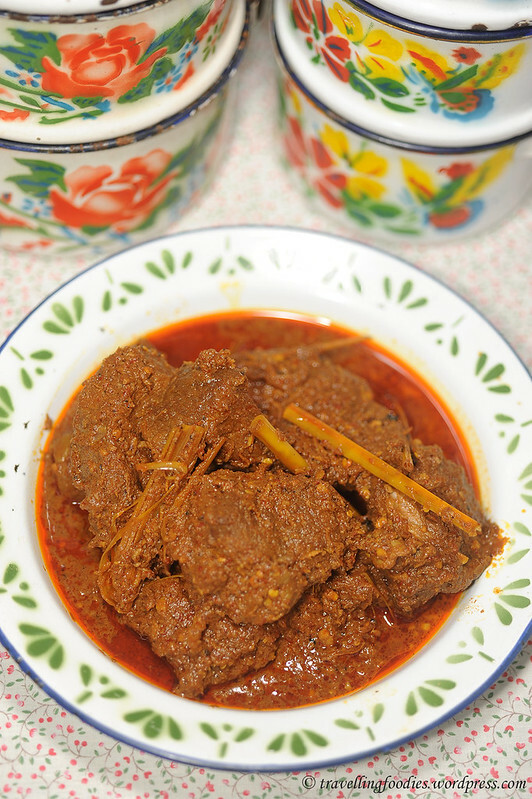 Rendang Daging Rembau is no exception. The orginal recipe calls for bird’s eye chili aka cili padi, reputed for its fiery heat. In fact it is so spicy that it not only sets the tongue ablaze, but it also burns the skin when in contact over a period of time. And a whooping 200g of it! A true reflection and testament to the courage of the Minangkabau people, which is not only displayed through the warrior tales of their historical past but apparently also through their food. I had to cut back the amount of cili padi used, to a modest 50g as I would be sharing the rendang with some of my friends, who have kindly volunteered to be my guinea pigs! 2. Place Ingredients (C) in a blender with some water and blend to obtain a fine paste. 3. In a large wok, first dry fry (C) WITHOUT adding oil to evaporate away most of the water used in the blending process. When the paste is sufficiently dry, add cooking oil, Ingredients (B), as well as crushed lemongrass in (A). Saute the blended spices over low heat until fragrant. 4. Add beef chunks and stir until well combined and dry. 5. Stir in coconut milk and top up with water until beef chunks are completely submerged. Cook over medium low heat until sauce is thick. This will take approximately 1 1/2 hours – 2 hours. Stir occasionally to avoid the sauce from sticking to the pan. 6. Meanwhile, prepare kerisik by toasting freshly grated coconut in Ingredients (D) until lightly brown. Pound toasted grated coconut to release the oils and set aside. 7. When the beef is almost done, stir in kerisik until well incorporated and season with salt and raw jaggery sugar. Continue to simmer until beef is completely tender. 6. Serve warm with hot rice. This entry was posted on January 31, 2013 by Alan (travellingfoodies). It was filed under Food, Simple Eats and was tagged with cili padi, fiery, hot, lemongrass, malaysia food fest, MFF, minangkabau, negeri sembilan, Rendang Daging Rembau, rendang. stewed beef, spicy. Came in for a closer look, still delicious! 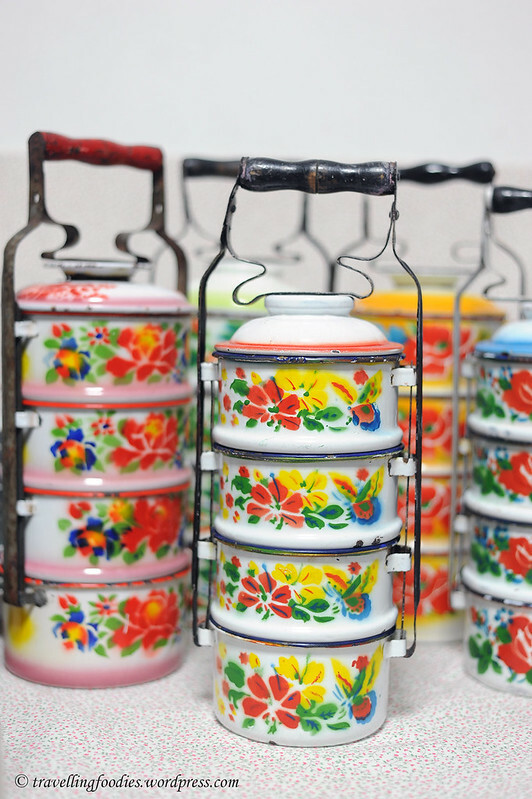 Love the tiffin carriers too! Looks great! Well mannered recipe. I’ll definitely cook this, but with some twists. Thanks alan, again. my pleasure to share with a fellow foodie like you! Akan, lean beef is it those call beef cube that used for stewing?